I just showed a newbie dwarf paladin how to get from Ironforge to Stormwind via the tram. It'd bring a tear to a glass eye. "been wowing for 4 years now and helping a polite freshman always makes me happy"
As long as its a polite one.... you ever get one of those guys that talks like, "omg nub how u get here tell me plz nub"? Yep. I tried to walk from SW to Loch Modan to do the package for Stormpike quest through the burning steppes oh so many years ago. I run a Paladin/Death Knight blog over at UnholyHands.Blogspot.com. You should stop by some time! Keep up the good posting! I remember seeing people flying by over head and thinking how important they must be. Heh. I also leveled my pally all the way to 60 as holy because that’s what I wanted to be and I didn’t know I could switch specs at a later level. When a dwarf newbie learns to train. Well, being a member of the aforementioned Freshmen class, I was wondering if anyone could clarify for me what type of stats I should be looking for on Armor to improve my tanking ability? I'm currently a level 53 Prot Pally attempting to levl to 80, and I currently have Strength>Stamina>Intellect>Spell Power, but this is more from the coincidence of picking up gear upgrades than any sort of personal planning. Do I need to reevaluate my Stat priorities? Hughbert, if you want to tank, you should use Warrior tanking gear. The key stats are Stamina, Defense and Strength. Other defensive stats like Parry/Dodge/Block are also valuable. You don't need Intellect or Spellpower. 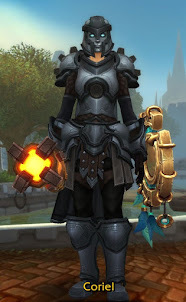 A Protection Paladin gears just like a Protection Warrior. Admittedly, it's confusing to gear at low levels, because Blizzard hadn't figured out what gear works well for paladins. You'll keep finding odd quest rewards, and think "why did they put this in the game? should I use it?" Most of the time, you shouldn't. Like Rohan said, look for stamina, defense, and strength. Other things help, but those are your core. Blizzard needs a complete overhaul of levling gear. It is amazing how much gear changes (and I look forward to it) when a toon reaches Outland and gets the gear that is acutally functional. Remember we were all nubs at one point...and remember what a good feeling you got when receiving help from accomplished players.Makes ya feel good about the realm you have chosen. This made me smile. I, too, couldn't figure out for the life of me how to get Stormpike his package. I actually tried walking through Redridge, into the Burning Steppes. Thankfully I was able to get out before an Elemental had his way with me. Of course, it wasn't until AFTER that I found out about sites like WoWHead.com and others... Ah, the old days.